Tuesday 31st May 2016 – 4.05pm – Murray MacGregor. 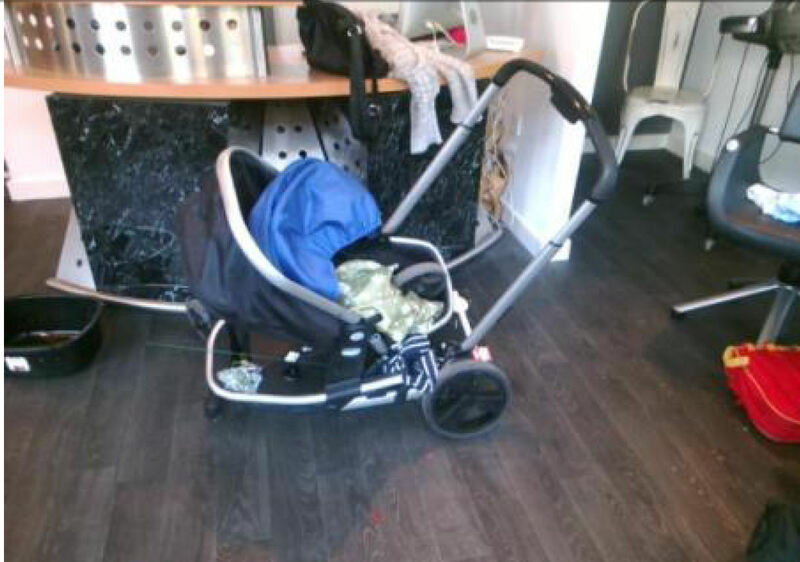 A toddler has had an incredibly lucky escape after a shop sign fell on his pram. An ambulance was initially responded and was backed up by the Midlands Air Ambulance from Cosford with the MERIT Trauma Doctor on board. 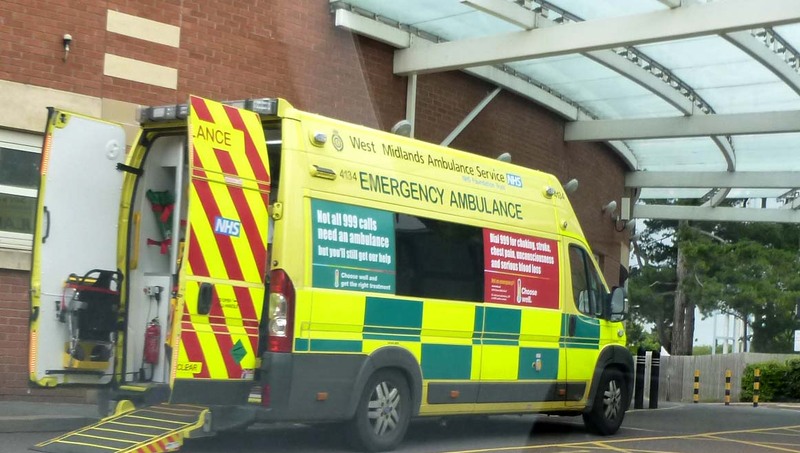 A West Midlands Ambulance Service spokesman said: “The 999 callers described how a shop sign about 1 metre square had fallen about 20 feet from a shop and landed on the pram. “On arrival, the crews found the 10 month old child and his mother in a nearby shop. “The pram appears to have taken the bulk of the force from the sign landing. “Tankfully, the little boy escaped serious injury. He had minor injuries to his head and lower leg. “After assessment by the ambulance crew and the doctor, he was taken to Princess Royal Hospital in Telford. “His mother, was understanbly very distressd by what had happened, but was also, fortunately unhurt. Tuesday 31st May 2016 – 9.30am – Murray MacGregor. West Midlands Ambulance Service was called to Shifnal Airfield at just before 5.00pm on Monday afternoon to reports of a light aircraft crash. The Midlands Air Ambulance from Cosford and a land ambulance arrived on scene six minutes after the 999 call. They were backed up by a second land ambulance and a paramedic area support officer. Sadly, the MERIT Trauma doctor updated shortly afterwards that there was nothing that could be done to save the two occupants and they were confirmed dead at the scene. Friday 27th May 2016 – 4.30pm – Claire Brown. A woman and a man have received treatment by the ambulance service following a two car collision just off the M40 in Warwick. 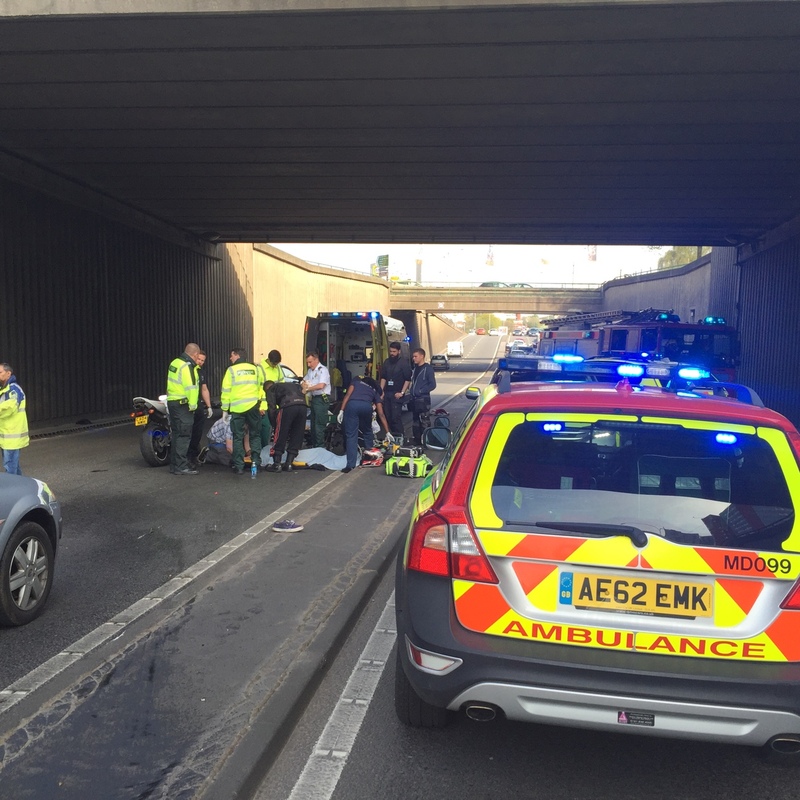 One of the Trust’s non-emergency patient transport service (PTS) ambulance crews came across the collision, which happened on the A453 near to the exit slip road of Junction 14 of the M40, at 1.45pm (Friday). 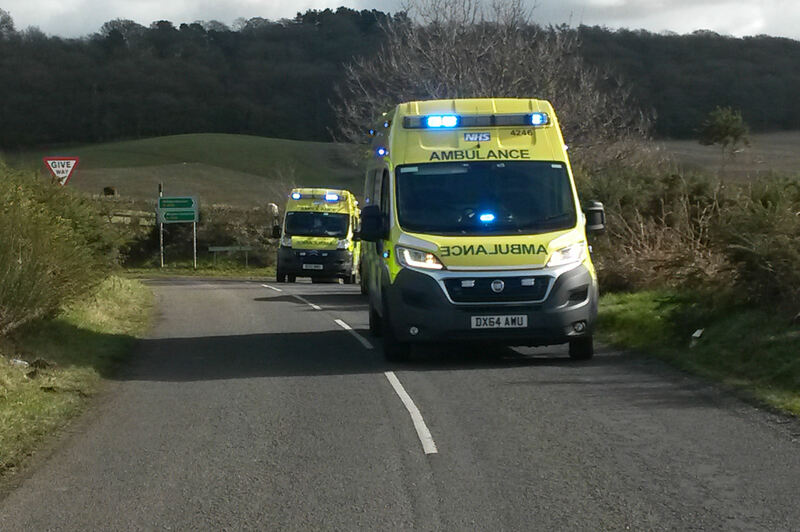 The PTS crew closed the road to traffic by positioning their ambulance across the carriageway and called the Trust’s emergency operations centre to request assistance. Two ambulances, a paramedic area support officer and the Warwickshire and Northamptonshire Air Ambulance with a BASICS doctor on board were sent to the scene. 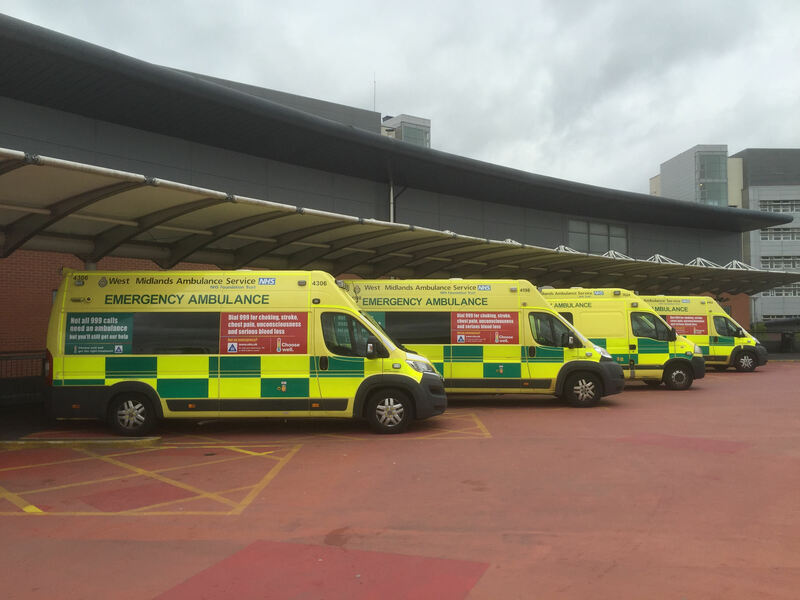 A West Midlands Ambulance Service spokeswoman said: “When ambulance staff arrived they found the PTS crew rendering excellent first aid to the two patients. One driver, a woman in her 50s, was trapped by her legs in the wreckage and despite suffering potentially serious leg injuries she was fully conscious. “Ambulance staff and the doctor worked as a team to administer pain relief to help relieve her discomfort whilst the fire service worked around them to release the woman from the wreckage. Once cut free, the woman was immobilised with a neck collar and scoop stretcher before being taken by land ambulance to University Hospital Coventry and Warwickshire where a team of trauma staff were waiting for her in A&E. Friday 27th May 2016 – 8.40am – Murray MacGregor. A motorcyclist has his leathers to thank for saving his life according to the paramedics who treated him after a crash last night. The 24 year old was involved in the crash in Witton Lodge Road in Erdington at 11.20pm last night. A West Midlands Ambulance Service spokesman said: “The initial report was that the rider was unconscious but when ambulance staff arrived he was fully conscious. The 24 year old was found some distance away from where his badly damaged bike was. A parked car was also damaged nearby. “The man had suffered chest injuries but the full ‘leathers’ that he was wearing had done their job and protected from many other injuries. “He was immobilised before being taken on blue lights to Heartlands Hospital where medics were on standby for his arrival. Wednesday 25th May 2016 – 2.20pm – Claire Brown. A fairground in Birmingham is not only offering customers’ screams and smiles, but if your heart stops, a life-saving shock won’t be too far away either. West Midlands Ambulance Service has teamed up with Robert Wilkinson Fairground and The Big Top Neighbourhood Watch Roadshow to provide life-saving training and equipment to help patients in cardiac arrest. Last month, the Trust’s Community Response Manager Andy Jeynes visited Pipe Hayes Park to train more than 30 staff and volunteers from the fairground and roadshow in basic life support and how to use an automated external defibrillator; a device used to help restart the heart of someone in cardiac arrest. The Trust has donated a defibrillator together with a training defibrillator whilst the British Heart Foundation has provided The Big Top Neighbourhood Watch roadshow with resuscitation dummies and a training DVD to enable them to hold training sessions to members of the public. The fairground and roadshow, which tours Birmingham and Solihull between March and November, has around 80 staff, volunteers and fair family members on site and regularly see 3,000k fairgoers a day through the gates. Mark Jastrzebski, Chair of The Big Top Neighbourhood Watch Roadshow, said: “Last year, a woman sadly died after suffering a cardiac arrest at the fair and despite the best efforts of ourselves and ambulance staff we couldn’t save her. Robert Wilkinson, owner of Robert Wilkinson Fairground, said: “Having a defibrillator on site and being trained in how to save a life is something very unique as I don’t think it’s ever happened on a fairground before. Our first aiders have been trained by Andy in how to use the defibrillator and how to do CPR. Pictured (left to right): WMAS Andy Jeynes, Tony St. John, ‘Juggler’ Martin Hughes, Robert Wilkinson and Mark Jastrzebski. Monday 23rd May 2016 – 6.50pm – Murray MacGregor. Dozens of school children and their teachers escaped a coach that burst into flames as it travelled on a busy motorway. The incident happened on the M6 northbound at Junction 3a at around 3.40pm on Monday afternoon. Two ambulances, a paramedic area support officer and a senior paramedic officer were sent to the scene. 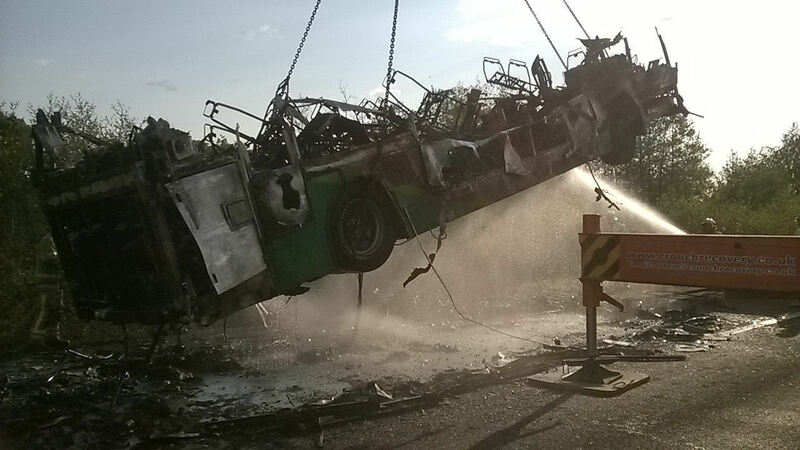 A West Midlands Ambulance Service spokesman said: “On arrival crews were greeted by the sight of a double decker bus that had been reduced to smouldering remains. “Thankfully the 59 children and 7 staff on board, who come from the Black Country, were safely sitting on a second coach that had stopped to offer assistance. “The Trust would like to pay tribute to the Eavesway Travel of Wigan coach driver who spotted the issue, stopped at the side of the motorway and helped evacuate the children. He then kept them and their teachers safe on his coach while firefighters dealt with the blaze. He then took them to the Motorcycle Museum where they were meeting up with a replacement coach to take them on their way. 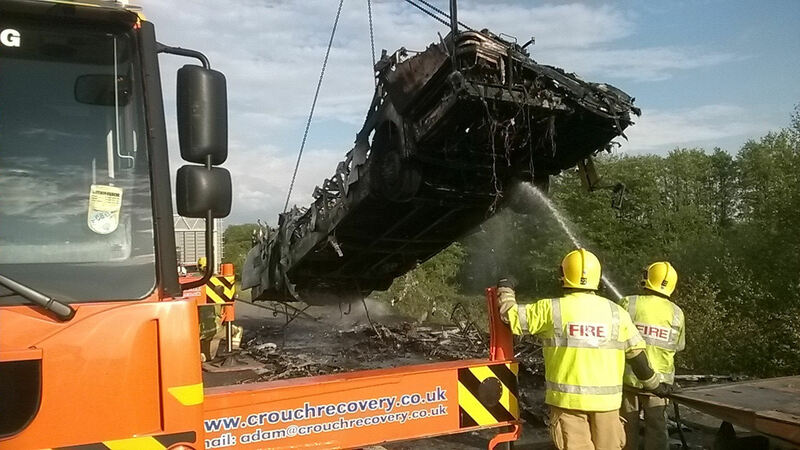 “In total, 13 children and the coach driver were assessed for smoke inhalation. “Four 10 year old girls were taken by ambulance to Birmingham Children’s Hospital for further assessment, though their conditions are not thought to be serious. Monday 23rd May 2016 – 10.05am – Murray MacGregor. A teenage cyclist has had to be rescued after injuring himself as he rode down a 50 foot embankment. The unfortunate incident happened at Judkins Quarry at Tuttle Hill near Nuneaton at about 5.45pm on Sunday afternoon. A West Midlands Ambulance Service spokesman said: “The 14year old was riding his push bike when it was reported that he had gone into some rocks and hit a tree. “Ambulance staff were told that he went over the handle bars suffering head and shoulder injuries. Monday 23rd May 2016 – 2.05pm – Murray MacGregor. 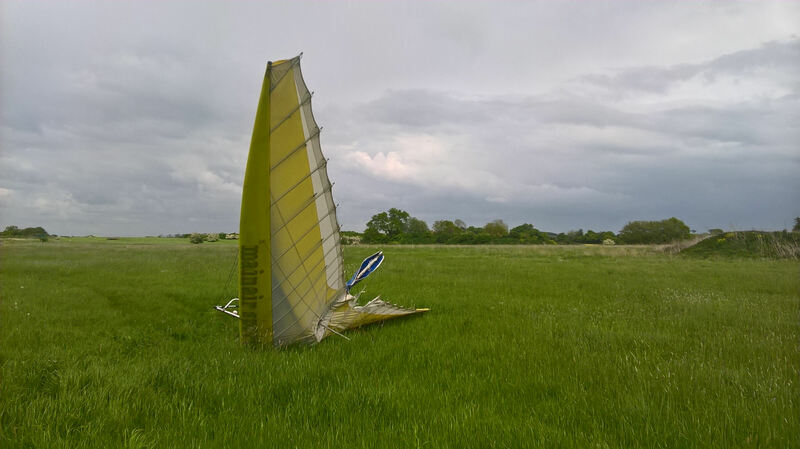 Two men have escaped serious injury after their microlight came down heavily as it came in to land. It happened at Long Marston Airfield in Warwickshire at about 2.15pm on Sunday afternoon. A West Midlands Ambulance Service spokesman said: “Initial reports were that it was a much more serious incident than it thankfully turned out to be. 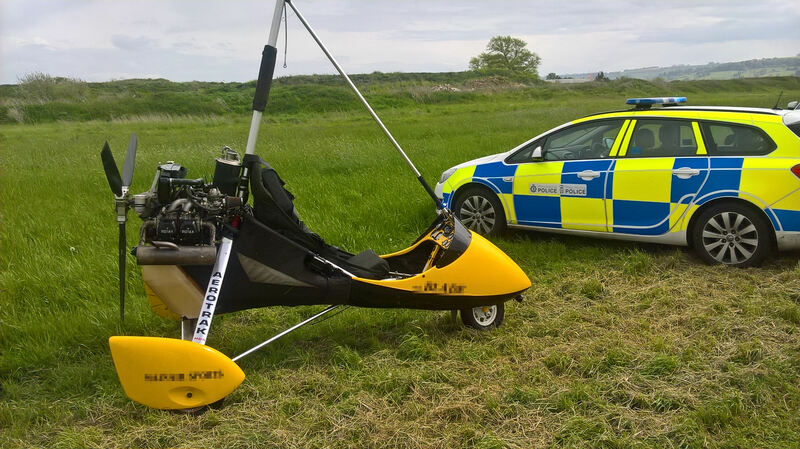 The pilot and his passenger, who were both in their 40s, were able to get out of the microlight themselves. One had suffered a wrist injury and both had minor cuts and bruising. “There was some damage to the aircraft; mainly to the wings. Monday 23rd May 2016 – 8.15am – Murray MacGregor. A motorcyclist has died after a crash also involving two cars. It happened on the A518 at Loxley at just after 4.30pm on Sunday afternoon. A rapid response vehicle, two ambulances, a paramedic area support officer and the Midlands Air Ambulance from Staffordshire were sent to the scene. A West Midlands Ambulance Service spokesman said: “On arrival, crews found a badly damaged motorcycle, one car on its side and a second with front end damage. “Sadly, it was immediately obvious that nothing could be done to save the motorcycle rider and he was confirmed dead at the scene. “The woman in the car on its side was helped out; she had suffered minor injuries but was taken to County Hospital in Stafford as a precaution. Friday 20th May 2016 – 4.00pm – Claire Brown. 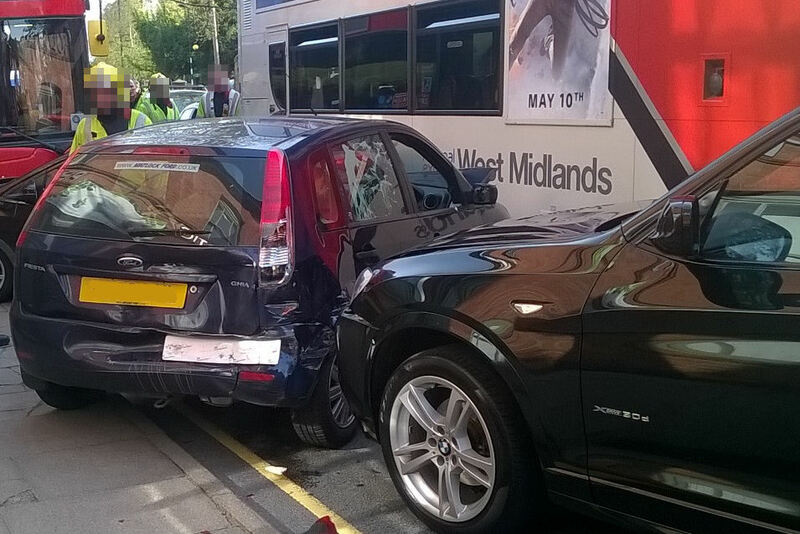 A woman received vital trauma care from West Midlands Ambulance Service this afternoon after being involved in a collision with a bus. The incident happened at the junction of Church Street and Parkfield Road in Stourbridge at 2.15pm (Friday). An ambulance, a community paramedic, a paramedic area support officer and the Midlands Air Ambulance from Cosford with a MERIT trauma doctor on board attended the scene. The helicopter landed at a nearby school and the aircrew made their way to the scene by foot. Friday 20th May 2016 – 1.00pm – Claire Brown. One woman has died and a young girl has received advanced trauma care by ambulance staff following a road traffic collision in Stratford-upon-Avon this morning. 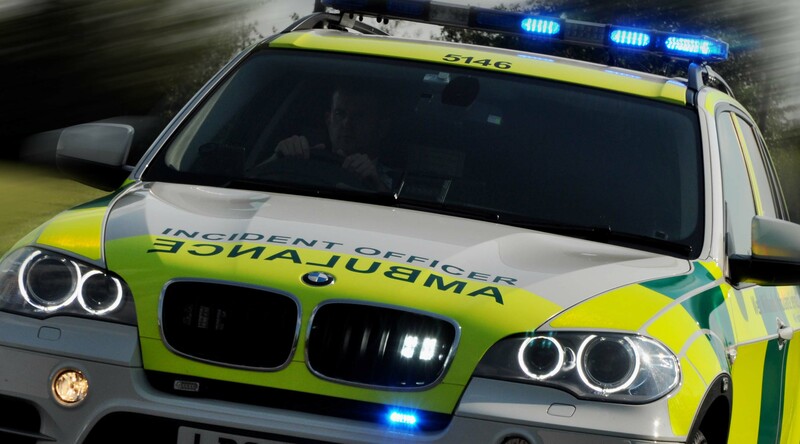 West Midlands Ambulance Service received several 999 calls to reports of a collision involving a car transporter lorry and pedestrians in Western Road in Stratford at 8.44am (Friday). An ambulance, a community paramedic, two paramedic officers, the Midlands Air Ambulance from Cosford with a MERIT trauma doctor on board and a BASICS doctor and paramedic from the Warwickshire and Northamptonshire Air Ambulance base attended by response car. 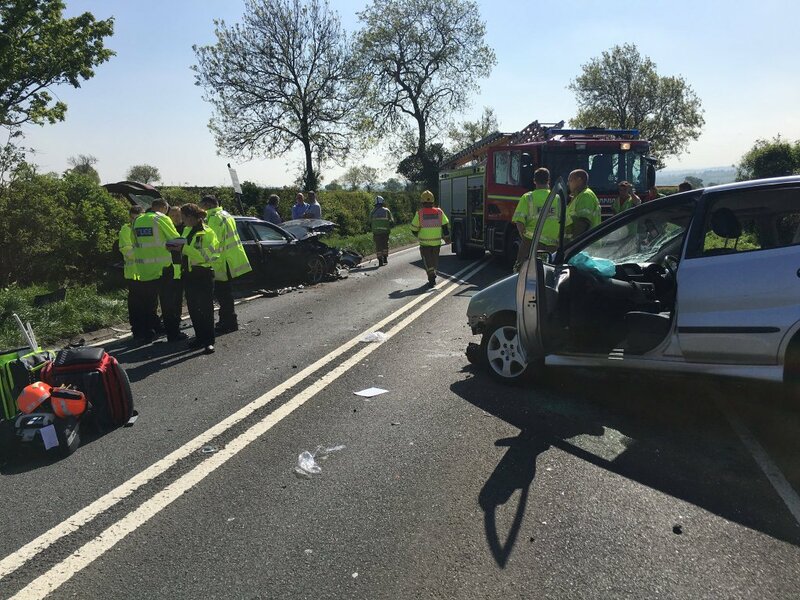 “A young girl had also been involved in the collision and upon further assessment by ambulance staff and medics they found she had sustained multiple serious injuries. 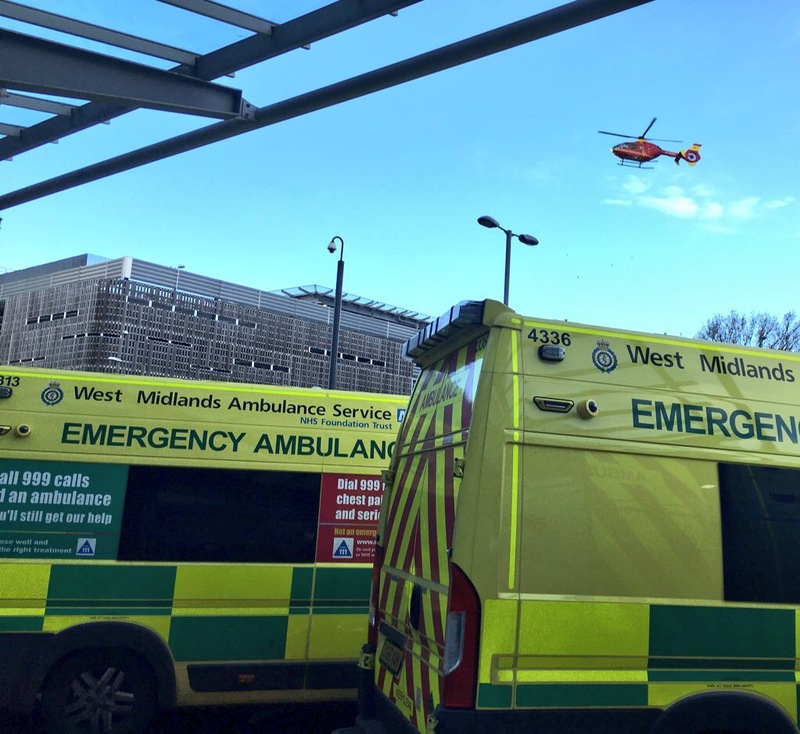 The little girl was given trauma care in the ambulance to help stabilise her condition before she was airlifted to Birmingham Children’s Hospital with a doctor on board. A second girl was assessed by paramedics but was uninjured and didn’t require hospital treatment. The lorry driver, a man, was checked over but was also uninjured. Wednesday 18th May 2016 – 6.20pm – Murray MacGregor. 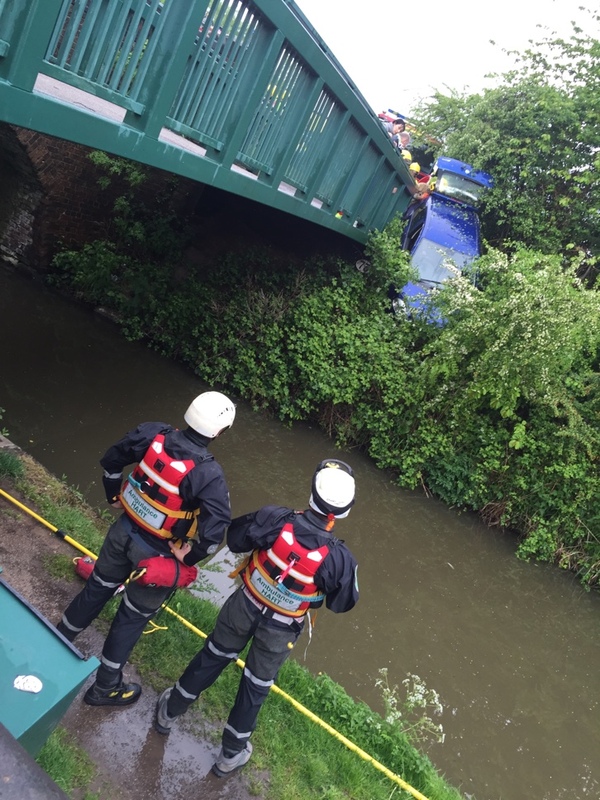 A woman has been rescued from a car that was left hanging precariously at a 40 degree angle about 10 feet above a canal. The incident happened at about 4.20pm on Glascote Road in Tamworth just off the roundabout at Abbey Road. 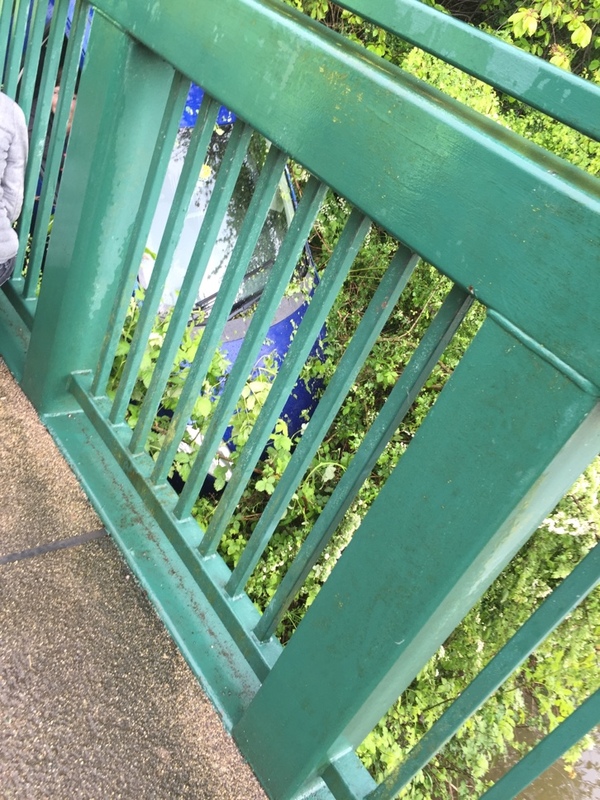 A West Midlands Ambulance Service spokesman said: “On arrival, crews found the small blue car hanging above the water, held only there by some of the bodywork that had hooked onto the bridge railing. “The car was completely unstable and would not have been safe to get the woman out immediately as it would have risked dislodging the car and it crashing into the water. 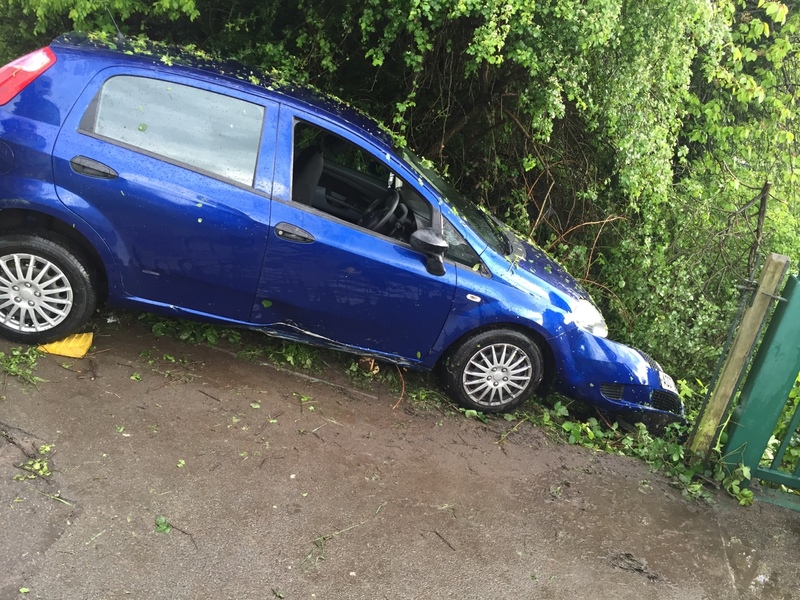 “Two members of the HART Team donned their water rescue gear and stood by ready to go into the water while firefighters firstly secured the car and then removed the seats and helped the woman to climb out through the back window of the car. “The woman, who was in her 50s was uninjured and was discharged at scene. Tuesday 17th May 2016 – 2.05pm – Murray MacGregor. A woman has been airlifted to hospital after a crash that saw her trapped in the wreckage of the car she was driving for about 45 minutes. The incident happened on the A46 Stags Hill in Warwickshire at about just after 9.00am this morning (Tuesday). An ambulance, a paramedic area support officer, the Midlands Air Ambulance from Strensham and the doctor from the Warwickshire and Northamptonshire Air Ambulance who responded in a response vehicle were sent to the scene. A West Midlands Ambulance Service spokesman said: “On arrival, crews found a Nissan and a BMW that had had a substantial impact; both had front offside damage. 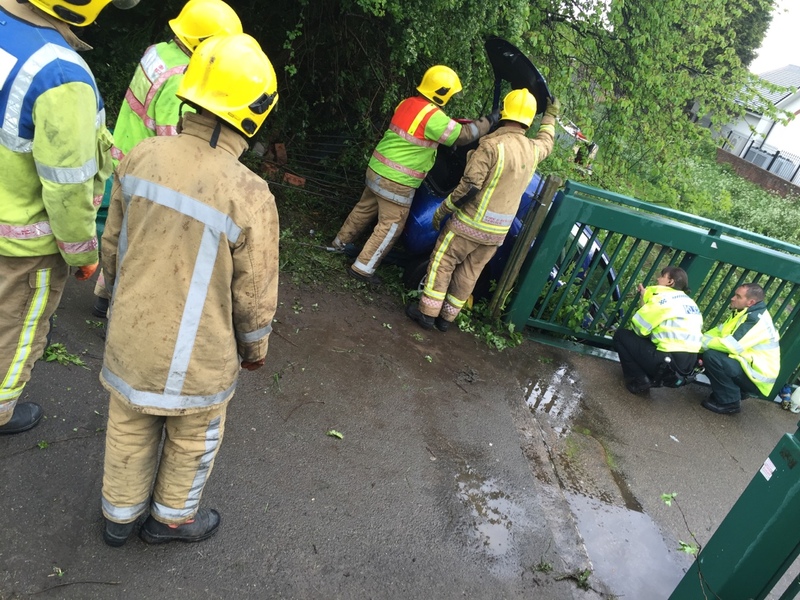 “The woman in the Nissan was trapped for about 45 minutes while firefighters and ambulance staff worked to free her while she was being treated. “The woman, who was in her 30s, had a reduced level of consciousness but was complaining of leg, pelvic and chest pain. She was immobilised and had a pelvic binder put in place before she was airlifted to the Major Trauma Centre at University Hospital Coventry & Warwickshire. Tuesday 17th May 2016 – 11.15am – Murray MacGregor. 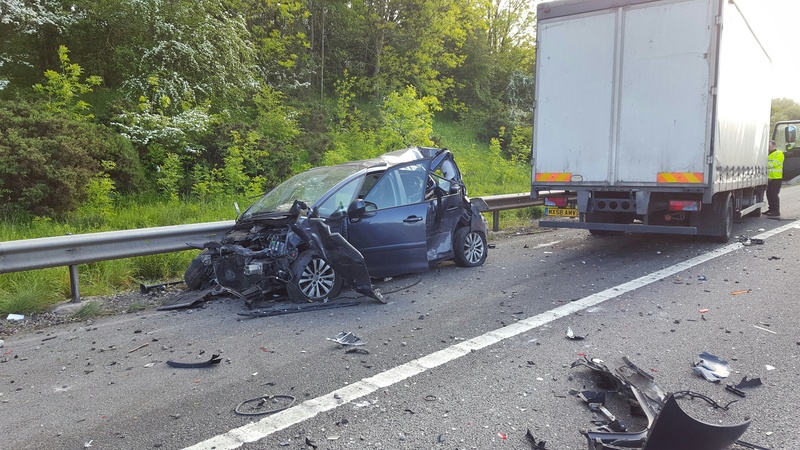 An early morning crash on a busy motorway left debris across the carriageway. The incident on the M6 happened between junctions 2 and 1 at just before 7.45am this morning (Tuesday). A paramedic area support officer, the doctor from the Warwickshire and Northamptonshire Air Ambulance, who responded in a car, and three ambulances, two from the West Midlands and one from East Midlands Ambulance Service, were sent to the scene. A West Midlands Ambulance Service spokesman said: “The crash happened about 1/2 mile before junction 1 on the southbound carriageway. 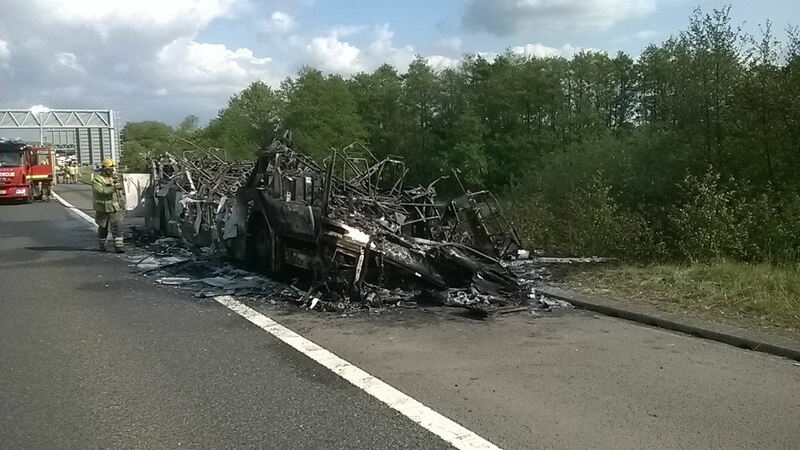 “When crews arrived, they found three cars and a lorry at the scene. 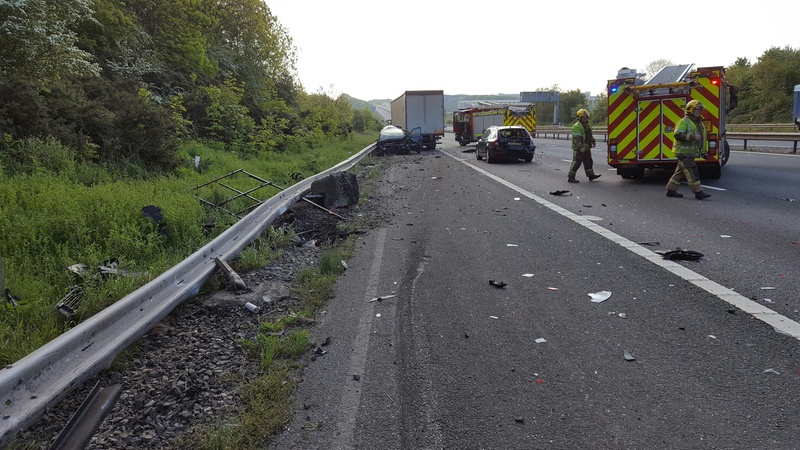 One of the cars was badly damaged as was a section of the Armco crash barrier. There was debris across all three lanes. “Thankfully, the injuries were not too serious, which allowed traffic to start moving again while emergency services worked at the scene. “A man in his 40s was helped out of vehicle before being taken by ambulance to University Hospital Coventry & Warwickshire with a suspected head injury. Monday 16th May 2016 – 5.45pm – Murray MacGregor. A motorcyclist had a ‘rubbish’ landing after a collision with a bin lorry left him with broken ribs. The unfortunate incident happened outside Broad Oak Garage in Broad Oak, Herefordshire at about 1.50pm on Monday afternoon. 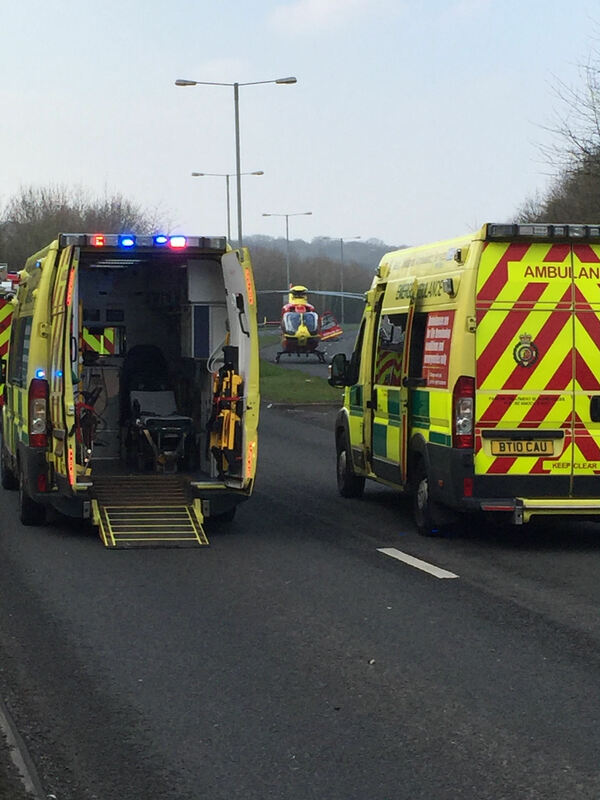 An ambulance was initially sent but was backed up by the Midlands Air Ambulance from Strensham. A West Midlands Ambulance Service spokesman said: “The incident happened close to the cross roads. The motorcyclist, who was in his 60s, tried to avoid the bin lorry but ended up catching the rear of the vehicle. “He was incredibly unlucky because he fell onto the upturned handlebars, landing on his ribs. Had he missed those he might have escaped injury completely. So it had to happen – ‪#‎RunningMan‬ Challenge duly accepted by Dudley Hub – who’s next? Monday 16th May 2016 – 9.05am – Murray MacGregor. A man riding a motorbike has died after a crash with a car. It happened on the A458 at Wootton near Bridgnorth in Shropshire at just after 1.00pm on Sunday. A West Midlands Ambulance Service spokesman said: “An ambulance arrived on scene 8 minutes after the initial call. Sadly, it was immediately obvious that there was nothing that could be done to save the rider. Monday 16th May 2016 – 8.44am – Murray MacGregor. Three people have been hurt, with a motorcyclist seriously injured after a crash on Sunday afternoon. It happened on the Fosse Way in Warwickshire at the junction of Windmill Hill Lane at Chesterton at 1.30pm. 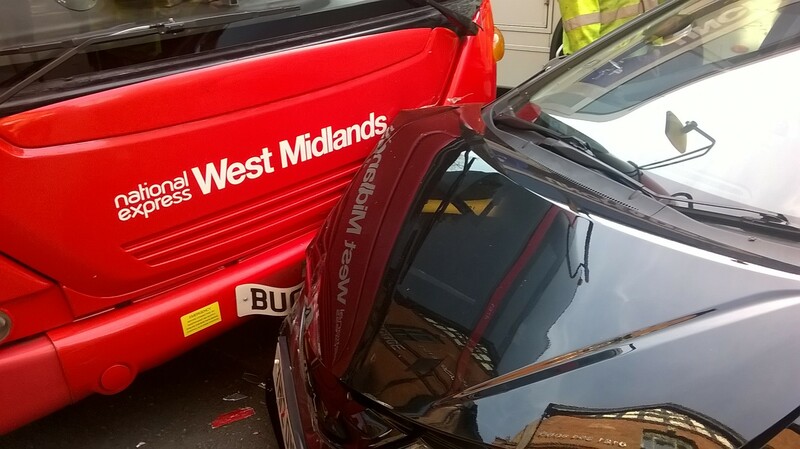 A West Midlands Ambulance Service spokesman said: “When crews arrived they found a red car with significant front nearside damage; two motorbikes that had suffered huge damage and a light blue Peugeot with minor damage. “One of the riders, a man in his 50s had suffered multiple serious injuries. 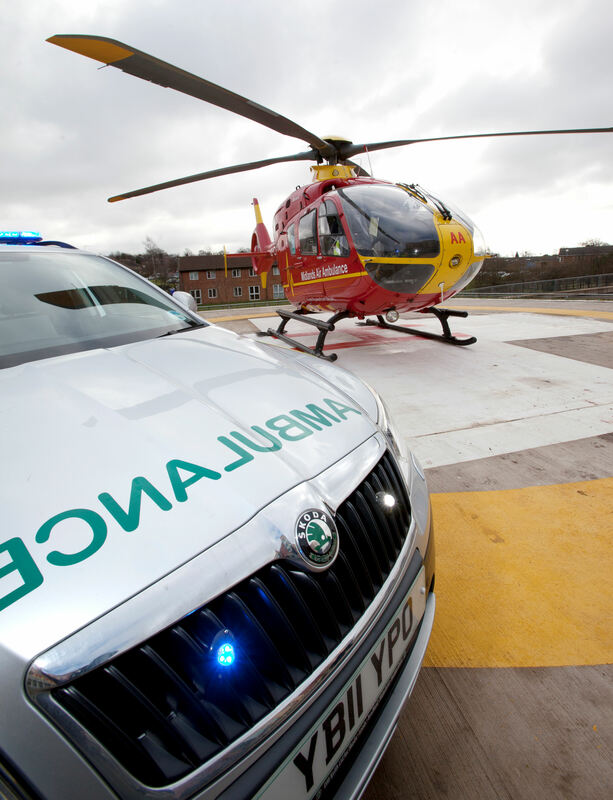 He was immobilised, had splints applied and was given pain relief before being airlifted to the major trauma centre at University Hospital Coventry & Warwickshire. “The second rider, who was also in his 50s was immobilised as a precaution and taken to Warwick Hospital, though he appeared uninjured. Friday 13th May 2016 – 4pm – Jamie Arrowsmith. An advanced paramedic from Worcestershire who is determined to help ‘Rebuild Nepal’ has returned from a second visit to the earthquake hit country. Phil Llewellyn, who is based in Pershore, first visited the country to offer aid in the wake of the devastating 7.8 magnitude earthquake that struck on April 25th, 2015. A second earthquake with a magnitude of 7.4 was to hit the region on May 12th. Phil was so touched by the damage and devastation caused, particularly in the village of Kaule, where he has friends, that he decided he wanted to help further. The village had been completely decimated with homes and schools having been destroyed, as well as people losing their lives. As a result, Phil set up the charity ‘Rebuild Nepal’. In the months that followed, he worked tirelessly to raise funds to support Kaule, giving talks and holding a Summer Ball, all of which helped to raise £8,000. On his return to Nepal in March, Phil took eight healthcare professionals with him and because Kaule relies heavily on tourist income generated by the trekking and climbing industry, they set off on an expedition to Annapurna Base Camp at an altitude of 4250m. During the visit Phil handed over the £8000, enough money to rebuild four houses, and the group were afforded a heart-warming reception by the people of Kaule. Reflecting on the trip, Phil said: “Kathmandu looks a lot better since the earthquake, but the remote villages, such as Kaule, look pretty much the same. “For almost 12 months these people have lived under tin sheets and tarpaulin and it is really sad to see. Now back in the UK, Phil plans to start fund-raising again in a bid to raise more money to purchase materials needed to rebuild more houses. If you would like to help fund-raise, or would be interested in arranging Phil to give a talk, visit www.gofundme.com/RebuildInNepal or email pmllewellyn@hotmail.com. If used please credit the images to West Midlands Ambulance Service. Top – Phil Llewellyn talks to the villagers at a presentation to hand over the £8,000. Middle – The group of healthcare professionals prepare to set off on their trek to Annapurna Base Camp. Bottom – Living conditions in the village of Kaule. Thursday 12th May 2016 – 5.30pm – Jamie Arrowsmith. A man was left hanging upside down by his seatbelt for about 45 minutes following a collision between a van and a car this morning. West Midlands Ambulance Service was called to the junction of Penkridge Bank and Broadhurst Green in Cannock, shortly before 2.15pm and sent three ambulances and a paramedic officer to the scene. A West Midlands Ambulance Service spokesman said: “There were six patients in total when crews arrived, four from the car and two from the van. “The most seriously injured patient was the passenger in the van who was suspended by his seatbelt, upside down, when crews arrived. “With the help of the fire service, who cut the door off the vehicle, the man was freed after his seat belt was cut. “He was treated at the scene for an arm injury and chest pain before being transported to New Cross Hospital. Wednesday 11th May 2016 – 9.30am – Murray MacGregor. A man has been pulled unconscious from a smoking car by an off duty paramedic. 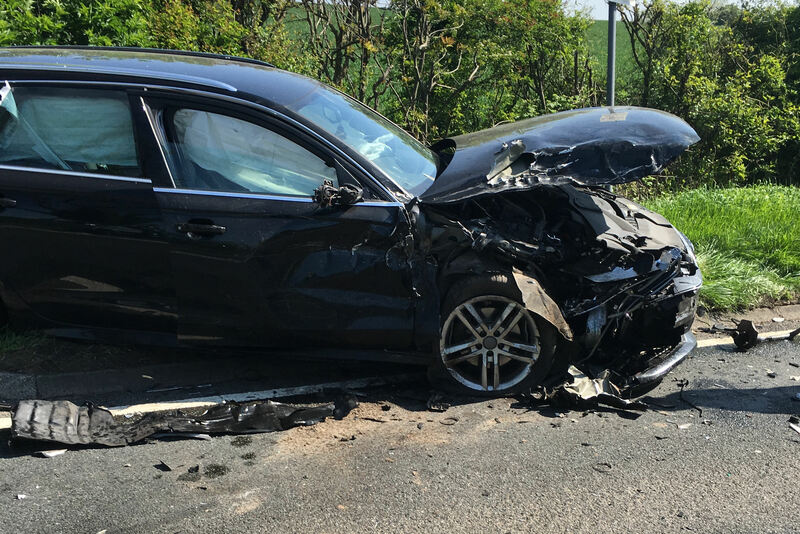 It followed a two car crash on the A45 dual carriageway at Stretton On Dunsmore in Warwickshire at about 5.45am this morning (Wednesday). 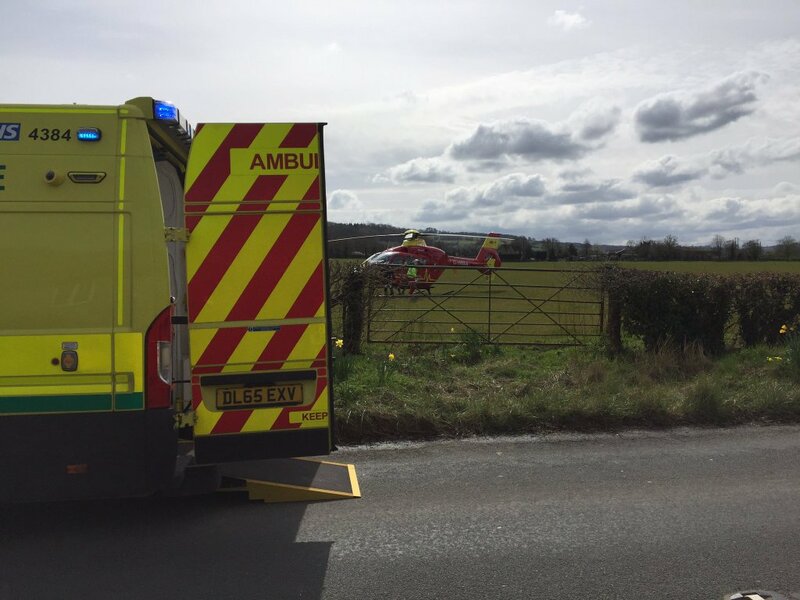 Two ambulances, a paramedic area support officer and two BASICS Emergency Doctors who fly with the Warwickshire and Northamptonshire Air Ambulance, were sent to the scene. A West Midlands Ambulance Service spokesman said: “The paramedic, who does not work for WMAS, is believed to have arrived shortly after the crash. “Due to the condition of the man in one of the cars and the fact that the vehicle appeared to be smoking, he took the decision to get the driver out quickly and start treating him. “The man, who was in his 20s, had suffered serious head and pelvic injuries. He started to come round while ambulance staff and the doctors treated him. He was immobilised and had a pelvic binder put in place before being taken on blue lights to the major trauma centre at University Hospital Coventry & Warwickshire. “Both vehicles had suffered considerable damage and this left the driver in the second car trapped. Ambulance staff requested firefighters attend the scene and the two emergency services staff worked together to get the man out. Monday 9th May 2016 – 5.15pm – Claire Brown. 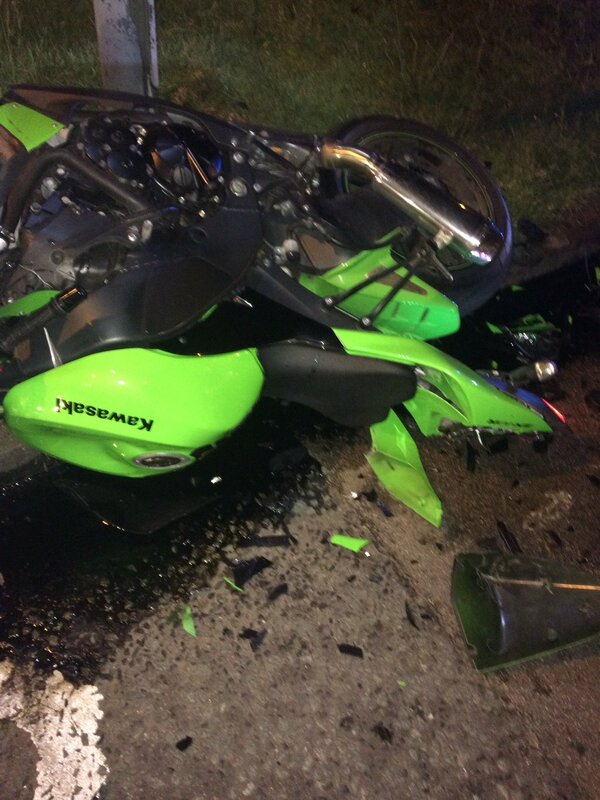 A woman has been injured after the motorbike she was a pillion passenger on collided with a car in Birmingham. The incident happened at the junction of Walkers Heath Road and Arrow Walk, Kings Norton at 1.20pm this afternoon (Monday). An ambulance and a responder paramedic attended. A West Midlands Ambulance Service spokeswoman said: “The 37-year-old woman was conscious and breathing when ambulance staff arrived but was in pain and, upon assessment, was found with multiple injuries. Monday 9th May 2016 – 4.00pm – Claire Brown. A man has been treated by paramedics after he was knocked over and injured by a water buffalo. An ambulance responded to a 999 call reporting a man had been injured by the animal in Seighford in Stafford at 1.20pm this afternoon (Monday). During the 999 call, the caller reported that the water buffalo had escaped its paddock and was on the loose in the village so our control room quickly alerted Staffordshire Police to the case. A West Midlands Ambulance Service spokeswoman said: “When the ambulance crew arrived, the buffalo wasn’t nearby so it was safe for them to proceed with treating the injured man. Friday 6th May 2016 – 9.15pm – Murray MacGregor. 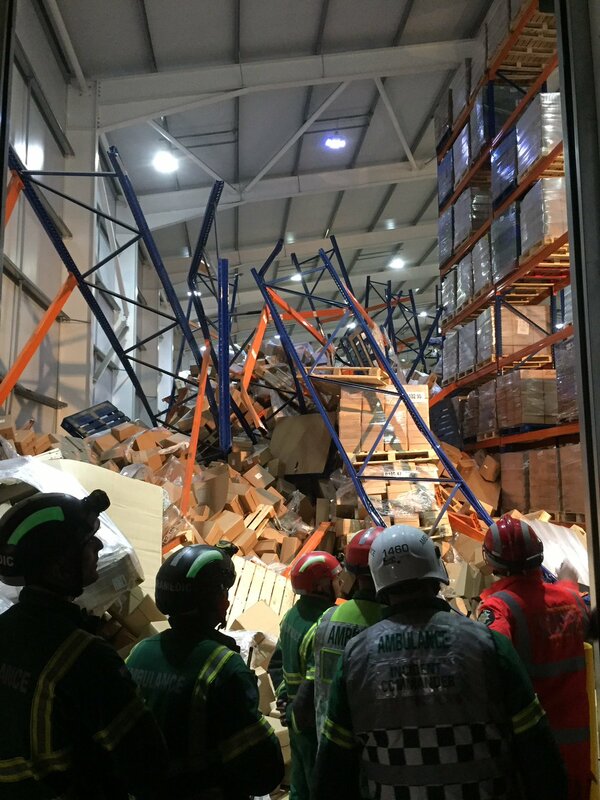 A forklift truck driver has walked free from the devastated insides of a warehouse after an accident that saw tonnes of good come down on top of him leaving him trapped for around eight hours. West Midlands Ambulance Service responded to the incident in Hatton Road in Hinstock near Market Drayton at 9.40am on Friday morning. 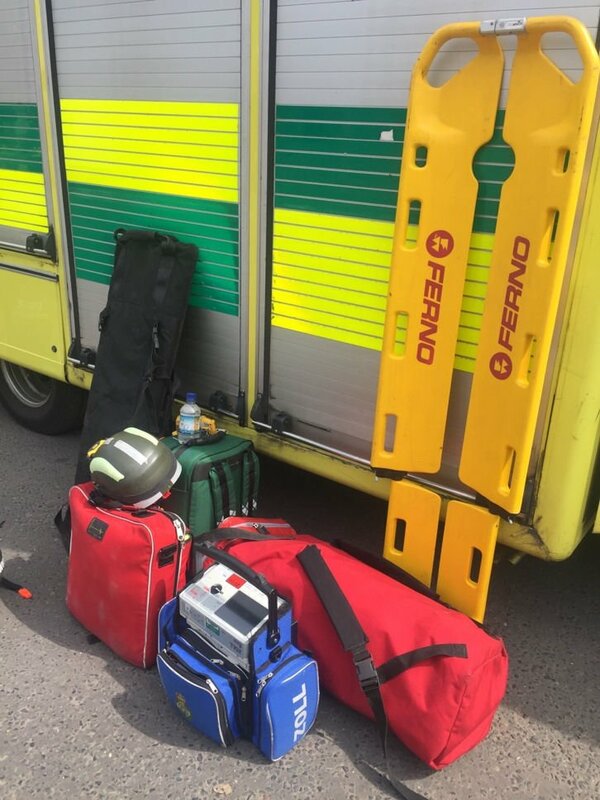 Initially, an ambulance, a BASICS Emergency Doctor, the Midlands Air Ambulance from Cosford with the MERIT trauma doctor on board were sent along with two paramedic officers and the Hazardous Area Response Team. A West Midlands Ambulance Service spokesman said: “One patient was treated at the scene for the effects of shock while fire and ambulance staff assessed the situation so that a resuce attempt could be mounted. 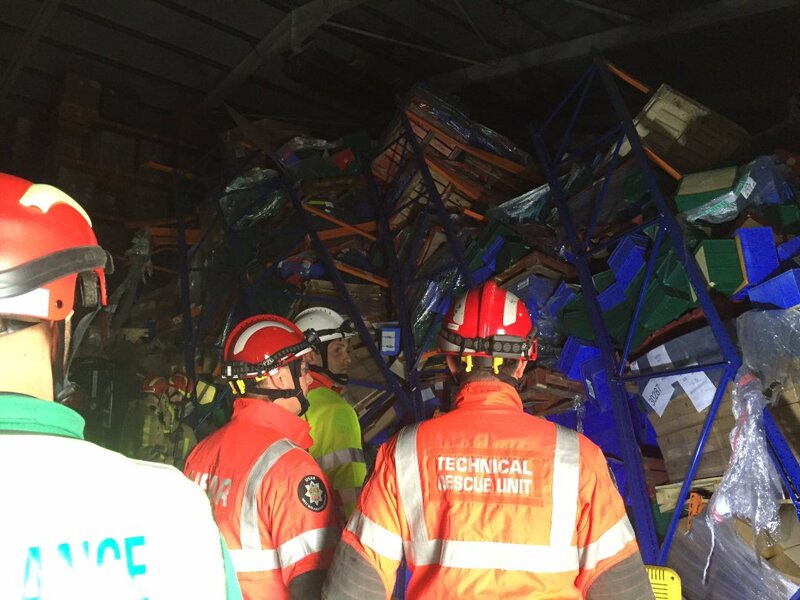 “Firefighters from Shropshire Fire and Rescue Service were joined by specialist Urban Search and Rescue teams from West Midlands, Merseyside, and Leicestershire. “They were joined by staff from West Mercia Police and the Health and Safety Executive. 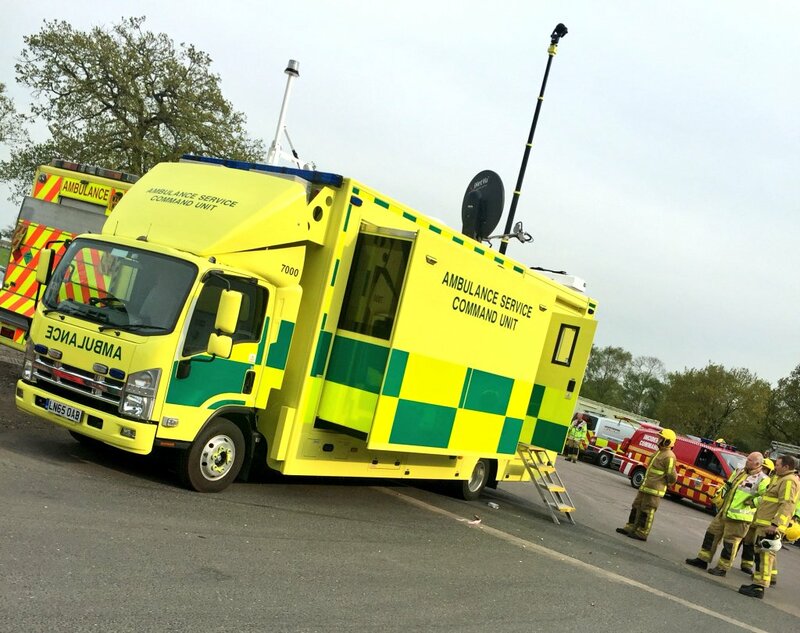 The operation was co-ordinated using the new WMAS Command Vehicle which has only recently entered service and provides the latest multi-agency working platform. 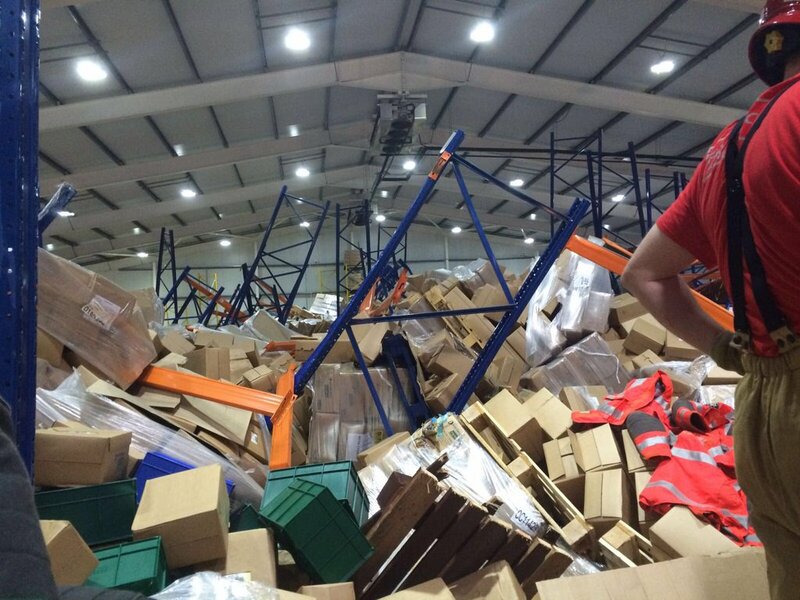 “Astonishingly, after so long trapped under the contents of the warehouse, the worker was able to walk out of the warehouse. He was then assessed by the paramedics from HART and was subsequently taken to Princess Royal Hospital as a precaution, but he appears uninjured. Friday 6th May 2016 – 10.40am – Murray MacGregor. Despite eight cars and two buses getting involved in a crash, only three patients needed ambulance assistance and all were discharged at the scene. 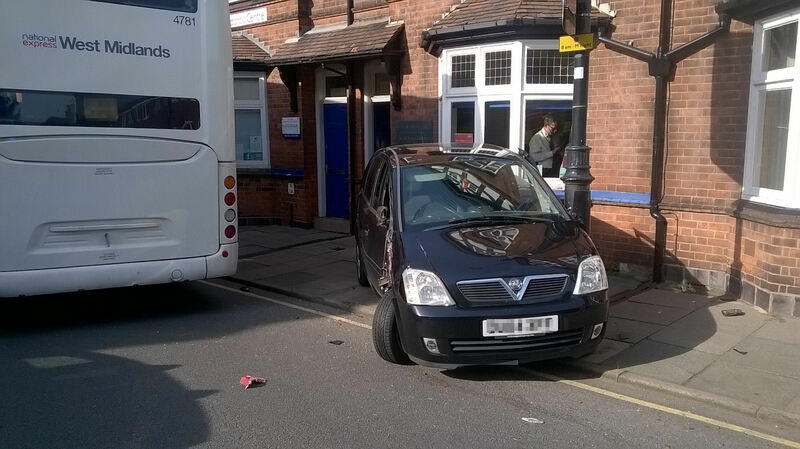 What can only be described as a ‘pile up’ happened outside the Sutton Dental Surgery in Coleshill Street, Sutton Coldfield at just before 5.00pm on Thursday afternoon. A West Midlands Ambulance Service spokesman said: “When the call came in, we did wonder what we would find, but thankfully it wasn’t nearly as bad as it could have been. A 25 year old lady on the bus who said that she had hit head and shoulder on the window. Although shaken, she was uninjured and also discharged. Friday 6th May 2016 – 9.30am – Claire Brown. A man who ended up trapped in the cab of his lorry for 50 minutes following a collision with a HGV miraculously walked away with just minor injuries. 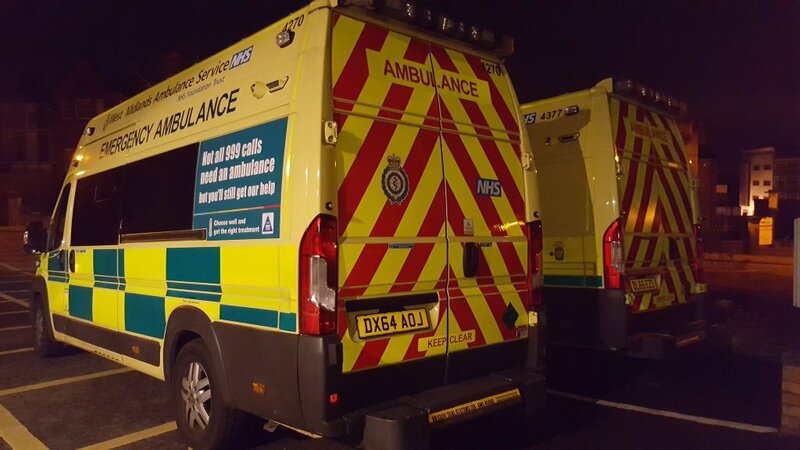 West Midlands Ambulance Service was called to the M6 between junctions 14 and 13 in Stafford shortly after midnight this morning (Friday). An ambulance, a paramedic area support officer, a senior paramedic officer and a North Staffordshire BASICS doctor attended. The Trust’s MERIT doctor was also responded but was stood down. A West Midlands Ambulance Service spokeswoman said: “When crews arrived they found a lorry with significant front end damage which had left the driver, a man in his 40s, trapped inside his cab due to the wreckage. Is it worth having scarring for the rest of your life or worse? If not, wear the right gear…please. Friday 6th May 2016 – 9.20am – Murray MacGregor. 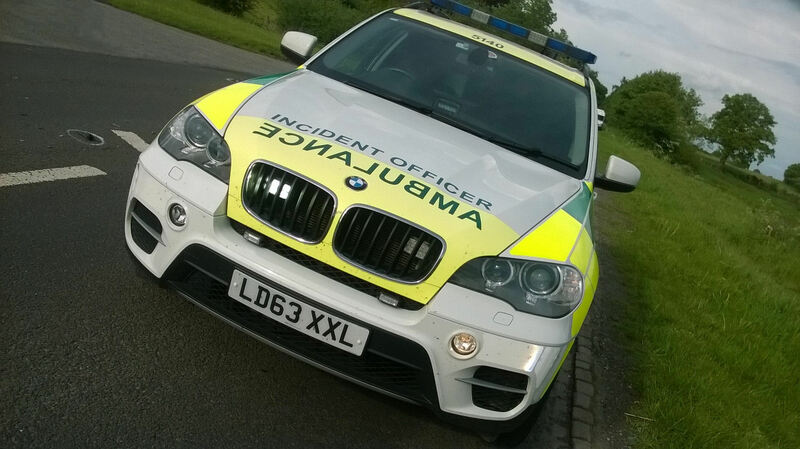 With the weather set to provide a gorgeous weekend, ambulance bosses are appealing to motorcyclists not to put themselves at risk by riding without appropriate safety gear. It follows a case in Birmingham city centre where a young man suffered serious ‘road rash’ after coming off his bike in tracksuit bottoms. The incident happened on Lee Bank Middleway in the underpass under Bristol Street/Pershore Street at about 4.30pm on Thursday afternoon. An ambulance was on scene within seven minutes and was backed up by a rapid response vehicle, a paramedic area support officer and a critical care paramedic in a response vehicle. A West Midlands Ambulance Service spokesman said: “When crew arrived they found the rider some distance away from where the remains of his bike were. They were on opposite sides of the dual carriageway. “Thankfully the rider, who was in his 20s, had not suffered serious injuries. However, his track suit bottoms had offered no protection and he had suffered extensive road rash which is not only painful but can also leave very nasty scarring. 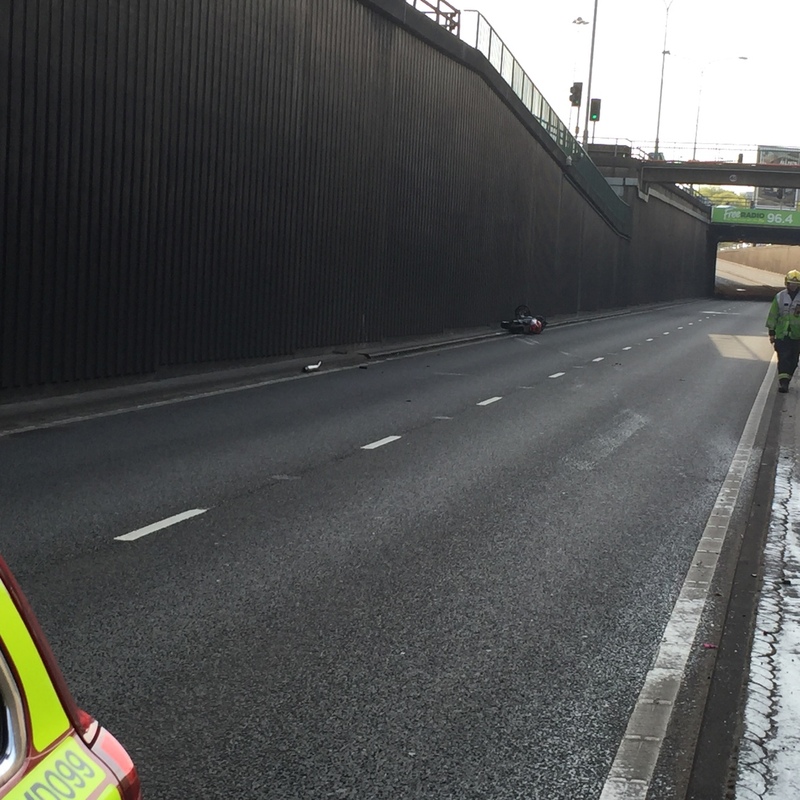 “In addition, the rider was complaining of a shoulder injury; he was immobilised and had a pelvic binder put in place before being taken to the Queen Elizabeth Hospital Birmingham. “As the weather has warmed up, we have seen people riding in shorts and t-shirts. While no rider expects to come off their motorbike, the reality is that some do. 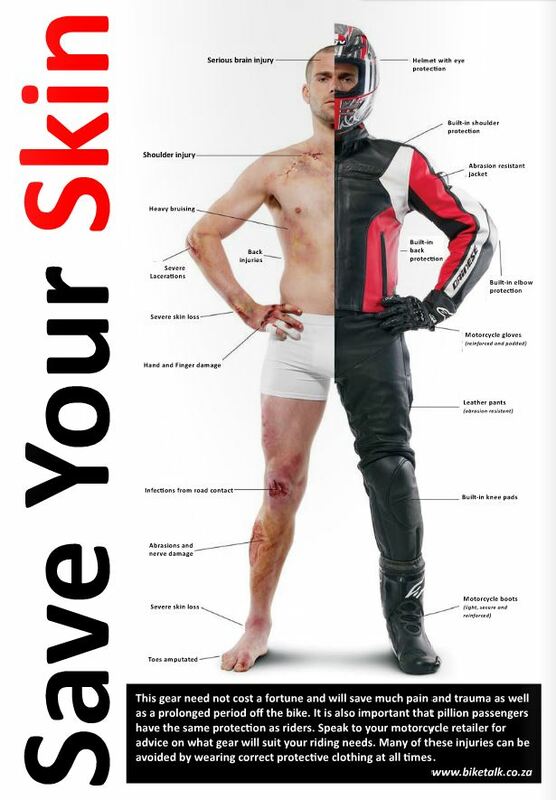 We know from extensive experience that those wearing good quality leathers, boots, gloves and obviously a helmet, suffer far less serious injuries. Thursday 5th May 2016 – 3.20pm – Murray MacGregor. Paramedics feared for an elderly woman’s arm after it got trapped under a car. The incident in Kidderminster resulted in firefighters from Hereford and Worcester Fire Service having to lift the vehicle with airbags to get her out. West Midlands Ambulance Service was called to Anchorfields at just after 11.00am on Thursday morning. An ambulance was initially sent but the crew requested back up from a paramedic area support officer and the Midlands Air Ambulance from Strensham, which landed at the Kidderminster Harriers ground. A West Midlands Ambulance Service spokesman said: “The woman had been trying to get a walking aid out from her car when the vehicle moved and she fell to the ground face down with her arm trapped under the wheel. “When ambulance staff arrived they had serious concerns about the level of damage to her arm. “Thankfully, once she was freed, the condition of her arm improved rapidly and after a full assessment at the scene, she was taken to Worcestershire Royal Hospital by land ambulance as a precaution with bruising. Thursday 5th May 2016 – 8.55am – Murray MacGregor. A motorcyclist suffered a severe leg injury in a crash that left him lying in a field. The crash happened on the Aston Ingham to Kilcot road in Herefordshire 6.55pm on Wednesday evening. A rapid response vehicle was on scene in eight minutes and was backed up by an ambulance shortly afterwards. A West Midlands Ambulance Service spokesman said: “When crews arrived they found a motorbike with significant damage, a tree that had crash damage and the rider in a field next to the road. “The rider, who was in his 60s had suffered severe leg injuries. “The crew immediately requested an air ambulance and the Midlands Air Ambulance from Stensham was sent to the scene. Wednesday 4th May 2016 – 10.40am – Murray MacGregor. A schoolboy has been airlifted after suffering serious leg injuries after a coach ran over his leg. The incident happened outside Kingsbury School in Tamworth Road, in Kingsbury. 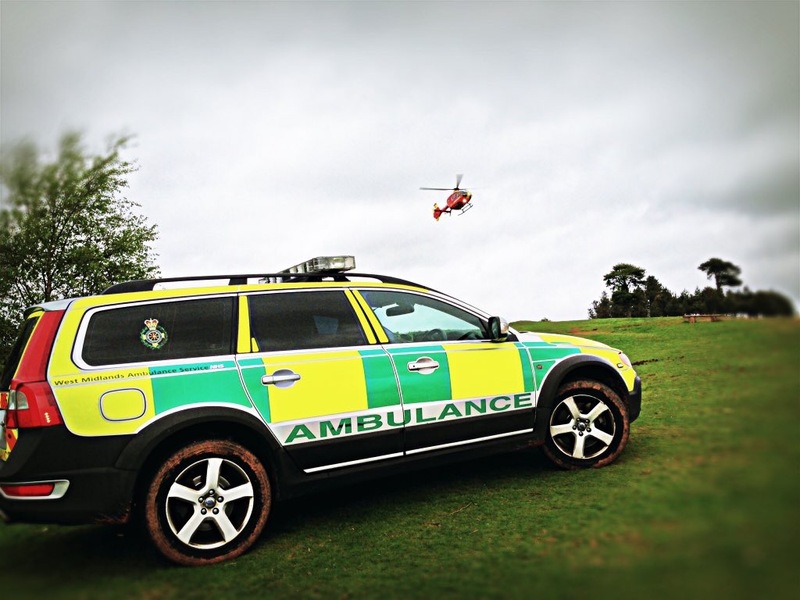 A rapid response vehicle was on scene within 8 minutes and was backed up by an ambulance, a paramedic area support officer and the Midlands Air Ambulance from Staffordshire. A West Midlands Ambulance Service spokesman said: “The teenager had just arrived at the school by coach when the unfortunate accident happened. “The youngster suffered serious traumatic injuries to his right foot and leg. 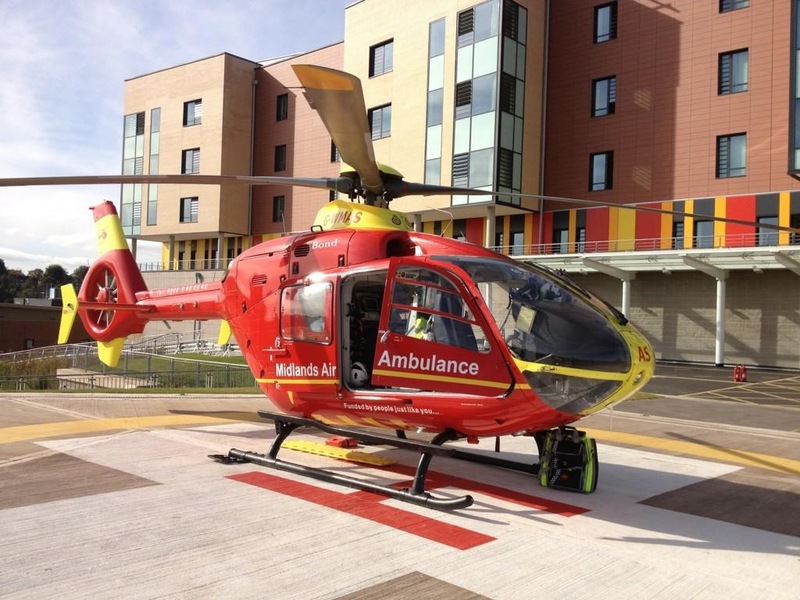 “After being sedated by the aircrew, ambulance staff worked on his leg before he was airlifted to the paediatric major trauma centre at Birmingham Children’s Hospital where a trauma team was on standby for his arrival. 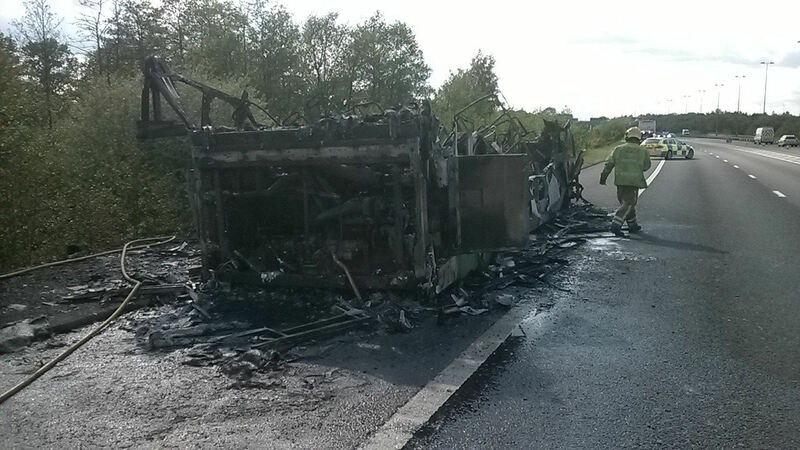 “The driver of the coach was assessed by ambulance staff but, although very shaken, was uninjured and was discharged. Wednesday 4th May 2016 – 9.55am – Claire Brown. West Midlands Ambulance Service joined North West Ambulance Service at the scene of a fatal road traffic collision last night. 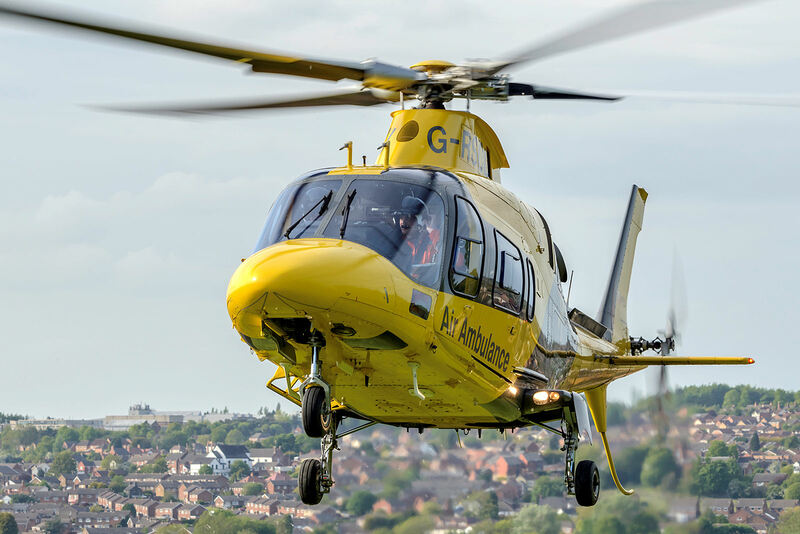 The Trust received a 999 call from Staffordshire Police shortly after 9.30pm (Tuesday) reporting a collision involving a HGV and a pedestrian just over the border on the A500 near Weston, Cheshire. An ambulance and a paramedic area support officer attended and were joined by colleagues from the North West. A West Midlands Ambulance Service spokeswoman said: “Sadly, it quickly became apparent to ambulance staff that nothing could be done to save the pedestrian and death was confirmed on scene by WMAS. Tuesday 3rd May 2016 – 6.10pm – Murray MacGregor. A building site worker has been airlifted with very serious crush injuries after an incident with a large tracked excavator. 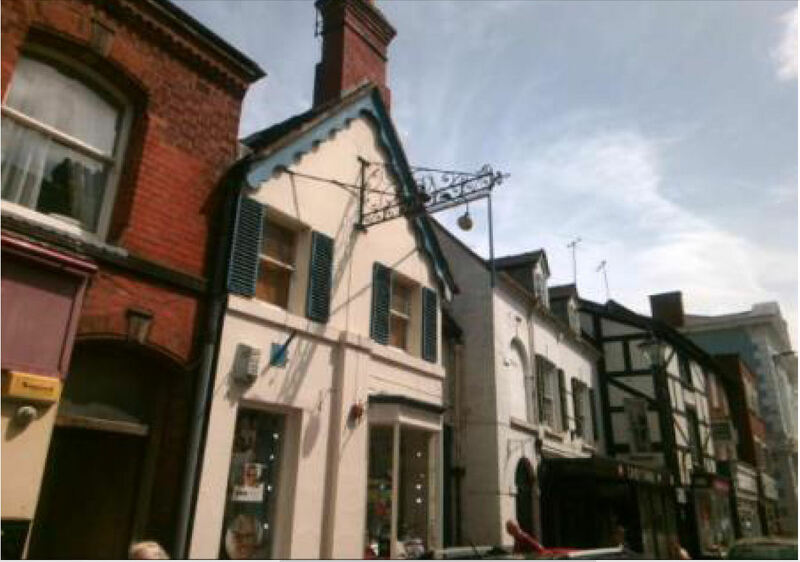 The incident happened at a site in Corporation Street in Stafford at about 3.30pm (Tuesday). A West Midlands Ambulance Service spokesman said: “On arrival, the man was found to have significant injuries on his right side. Tuesday 3rd May 2016 – 3.45pm – Murray MacGregor. It was a bank holiday and unsurprisingly, raining and cold. Not really ideal conditions to get two patients slipping and breaking their ankles deep in a wooded beauty spot. However, that was the situation facing ambulance crews yesterday. The service was called to the Bluebell Woods off Stratford Road in Wootton Wawen near Henley in Arden at just before 2.00pm on Monday afternoon. The first patient, a woman in her 50s was quite some distance from the nearest road and on a steep embankment. The paramedic from the rapid response vehicle that was sent was taken to the scene in a 4 x 4 vehicle. The woman had a fracture / dislocation of her right ankle. Despite back up from an ambulance, a community first responder and a paramedic area support officer, the conditions were sufficiently treacherous that the Hazardous Area Response Team (HART) was requested. The extra hands allowed the woman to be lifted up the slope safely before being taken to a 4×4 ambulance that had managed to negotiate the mud and rain to get to the top of the embankment. It took the woman to University Hospital Coventry and Warwickshire. While the staff were working on this case, they were made aware of a second patient who had also fallen and broken her ankle about 5 minutes walk away in the same woods. 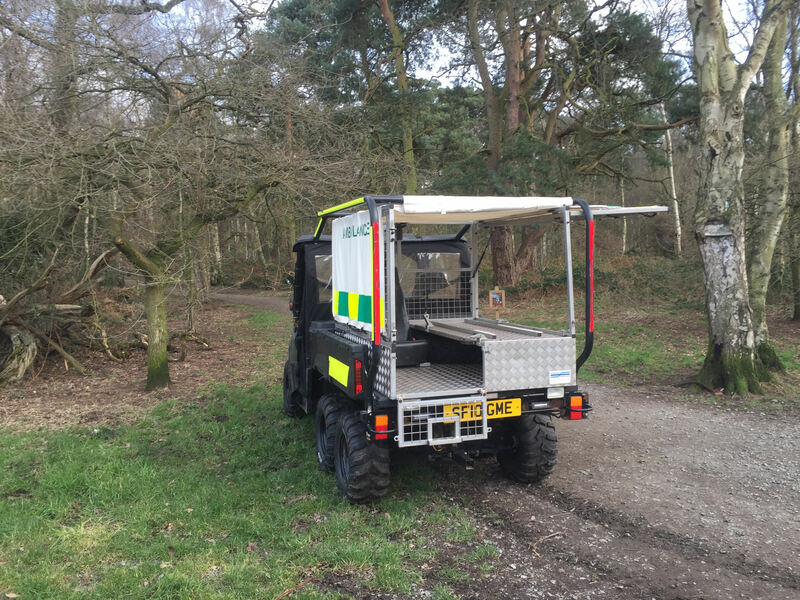 The HART team used their 6×6 Polaris vehicle to access this patient, so difficult were the conditions. She was transported back to a land ambulance which took her to the same hospital. 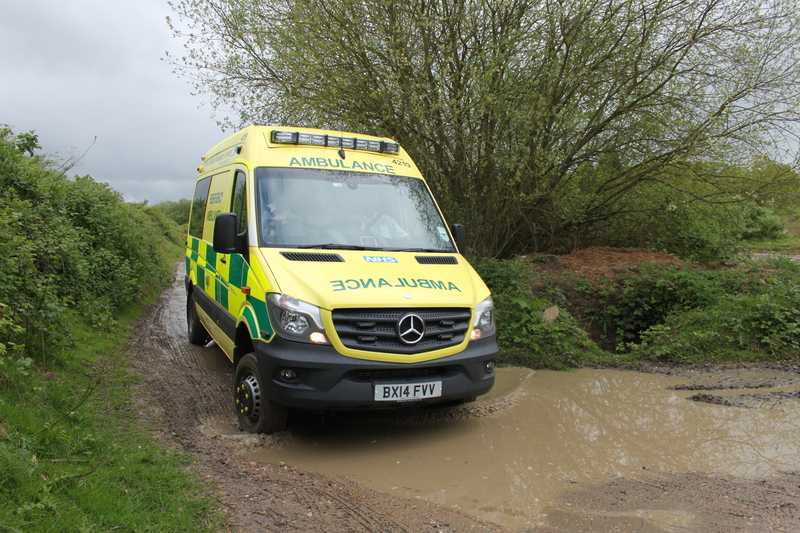 A West Midlands Ambulance Service spokesman said: “Once again, the value of having a 4×4 ambulance has proved its worth. Being able to get that far into the woods would have been impossible in a normal vehicle. Tuesday 3rd May 2016 – 2.15pm – Murray MacGregor. 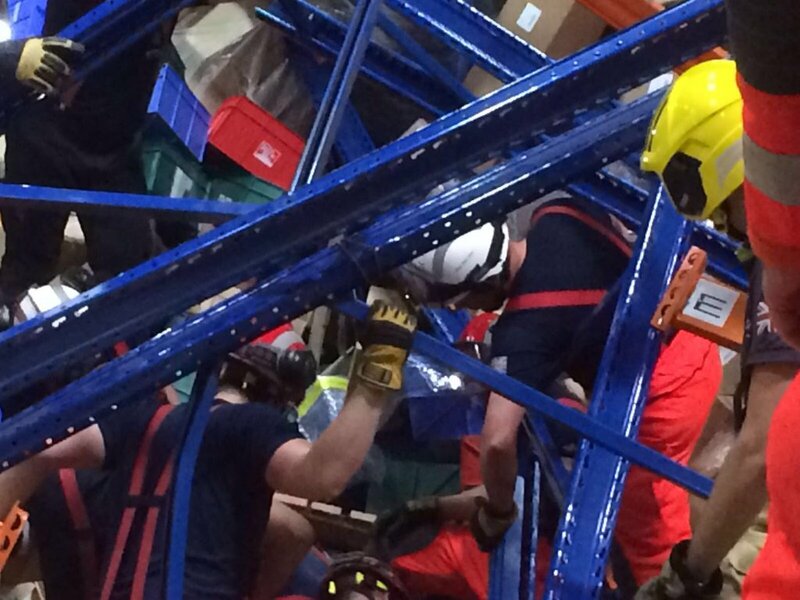 A worker has been airlifted to a major trauma centre with a serious leg injury after an accident at a factory. The incident happened at the premises in Bridge Road, Cookley near Kidderminster at about 8.30am this morning, Tuesday. A rapid response vehicle was first on scene backed up by an ambulance, a senior paramedic officer and the Midlands Air Ambulance from Cosford which landed on the nearby cricket and football pitches. A West Midlands Ambulance Service spokesman said: “The man had been injured when a high pressure hydraulic line broke hitting him on the left leg. 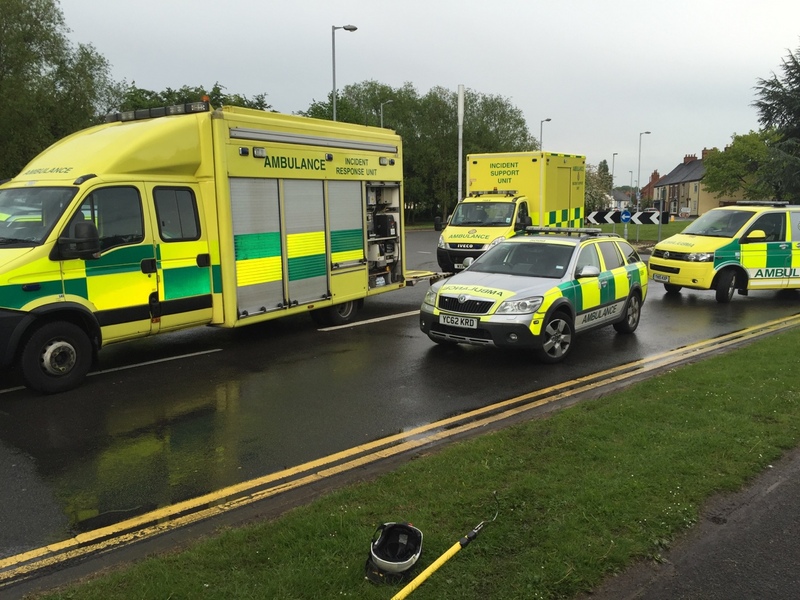 “He suffered a serious injury which was initially treated at the scene by ambulance staff.